With modernisation has come the pressure on the forests. Though almost three-fourths of the country is still covered by dense foliage, the demands from a growing population can put unprecedented demands on them. Be it for construction, fuelwood consumption, infrastructure development, it cannot be underestimated. At the same time, 60 per cent of land under forests have to be maintained for all time to come. So how does the government plan to tackle the growing demands? "There are a lot of places in Bhutan where people unknowingly use valuable trees, such as oak, as fuelwood. They should be made aware of their worth," says Petri Lehtonen, senior forestry specialist, indufor Oy, Finland. To make the people aware of all this as well as to empower them, the government has embarked on community/social forestry programmes. "However, the concept of community management of forests is not very old. Since forests are in plenty, and the population is very small, the need to conserve forest resources has never been felt. But now we are introducing community forestry," says B B Chettri. "However, I am unsure of the basic objective -- management or utilisation of forest resources," he adds. The confusion about community or social forestry among forest officials, many of whom were trained in India, is apparent. However, Jean-Claude Balcet, senior agricultural economist, Rural Development South Asia Region, feels that though the effort made by the government cannot be overruled, there is a lot more to do. The World Bank and Swiss development Organisation is carrying out a joint (forestry) mission in Mogar district, one of the components of which is social forestry. "There has not been much progress because social forestry rules have not been passed. Traditional rights are very strong and so are the government's conservation plans," she says. Balcet cites the example of Khaling Kharchungla forest management user village where the people openly protested against the government's conservation plan. Retaliates Sangay Wangchuk, "There may be isolated cases of people resenting conservation efforts, we cannot generalise." "If we want to protect the forests, we know we have to empower the local people. They should be brought in and in fact presence of forest officials much be reduced. But all this cannot be done overnight. It took Nepal decades to successfully manage their forests," defends Sangay Thinley. The government is also planning to bring in all the forests under a scientific managed plan. "Earlier, there was an ad hoc harvesting system. It was need-based. Now there are rules and regulations for harvesting," says B B Chettri. " All the forest areas will be brought under scientific management practices within 20 years," says D B Dhittal, head, forest resources development section, forestry services division, moa . "We map the area and prepare land use maps, devise our cutting patterns, among other things. In some areas, we target conservation of a particular animal specie and create buffer zone," he adds. There is a timber pricing policy also. The government has banned export of timber and is expected to ban export of semi-finished wood products. Within the country, an auction takes place where all the bidders are government-recognised agencies. "The overall purpose is not to generate revenue, but to meet the local demands and sustainability of forest resources," says Tashi Geley, divisional manager, Wang division, Forest Development Corporation ( fdc ), Thimpu. To further regulate timber prices and supply, moa recently announced some measures, which include increasing the number of forest management units, establishment of three sawmills, which will be operated by fdc . The new announcement came in the wake of a study of the timber price and supply following implementation of the Revised Timber Pricing and Marketing Policy in January 1999. Though all forest areas are state-owned, the people still maintain traditional rights to forest resources. "Apart from collection of minor produce, every Bhutanese citizen is entitled to timber at concessional rates -- as low as Rs 10 per tree for conifer and Rs 30 for broad leaf. In summer, they can apply to the forest department. By December they are given the logs. But in case of emergency, they are able to get the supply the same day itself. The procedure may be lengthy but there is no red-tapism. It moves very fast," says Dhittal. There are nine national parks in the country but, unlike India, the government, has recognised the indigenous rights of people. "People have continued living in the parks and meeting their basic needs. They follow their traditional cropping practices. There are schools inside the parks and life has been going on. So there is no need to displace them in the name of conservation," says Kinlay Dorjee of wwf . "In the long run, we ( ngo s) would like some kind of concept where national park management will be managed by the local people alone. They should be given autonomy but this will take some time, at least 10 years," he says. "Their way of life was in any case eco-friendly even when there was no presence of the state. This we can attributed to the Buddhist way of living -- just take what you need, don't destroy anything else. Hence, conservation is much easier for us. We don't have to work as hard as our counterparts," says Sangay Wangchuk. It is true that in some cases, people have questioned the need for conservation. But, says Wangchuk, various other schemes such as rural credit and communication facilities given by the government have made them realise that no harm is meant. "This understanding has even reduced the conflict between foresters and communities," he says. "Conservation is a hindrance to development, which is the case elsewhere because it entails rules/enforcement, working with the communities. One has to give equal weightage to both conservation and development," says Lam Dorjee. 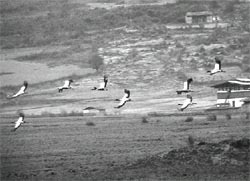 Phobjikha in Wangdue district is one place where rspn along with undp and the government is trying to integrate the two in the conservation of the endangered black-necked crane ( Grus nigricollis ), which migrates from Tibet to Bombdiling in Yangtse district and Phobjikha in western Bhutan in the winter months. "A year back, people living in four blocks in Phobjikha set up a committee to make a safe habitat for the cranes while earning from eco-tourism at the same time. The committee has now banned people from going near roosting areas, local people have been trained as guides for tourists and all the earnings are used for village development activities," says Seeta Giri, national project officer, United Nations Development Fund -Bhutan. "I do not know how this will work in the future, but as of now it seems favourable," says Lam Dorjee. If there is one thing the forest officials loathe is the livestock because the "huge herds of cattle eat small plants and saplings". Since the livestock population is very high, some have even suggested culling of animals. "The pragmatic solution would be to stall feed," says D B Dhittal. Animals owned by nomadic communities are a nuisance, others can be tackled, he says. But because people have traditional grazing rights, it is difficult to impose a ban. "In the area between Paro and Ha, the forest cover has gone down by 50 per cent. The trend may change with awareness of the adverse impacts of grazing, but there is no immediate solution," he says. Tshering Tashi suggests taxing families who have more than a stipulated number of animals.